It may be constructive to compare this joseki with the josekis at 34PointLowApproachThreeSpaceLowPincer#diagonalAttachment and 34PointLowApproachThreeSpaceLowPincer#cornerAttachment. Extending at or a is peaceful for both sides. at a is discussed at honte lib 1. The approach at is usually a show of strength either at the top side or the left side, and leaves Black with a open skirt. 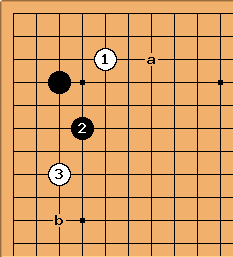 Black usually chooses to pincer at either a or b. If the pincers are infeasible, defending the corner by and is common. 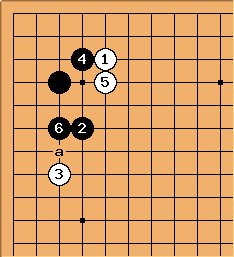 However, the Black stones are inefficient. 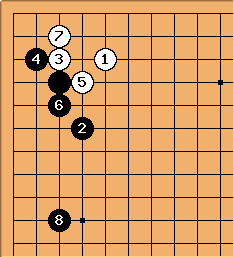 If Black is able to foresee that would be a severe move, then might not be a suitable response to . 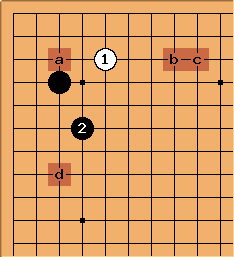 In this case, Black may consider playing at a instead. See 3-4 point low approach two space extension for more information.